Casa Vista Verde - Your Personal, Private Exclusive Beachfront Resort! Looking for your vision of a tropical retreat? Find it at Casa Vista Verde! This custom home brings together a beautiful private beachfront location, luxury accommodations, and exceptional amenities to help create lifetime memories for you and your guests. 5 private bedrooms with full ensuite baths, a fully equipped kitchen with standalone icemaker, and state of the art media centers keep you comfortable inside. Outside, you'll find swimming, scuba diving, kayaking, snorkeling, fishing, windsurfing, and wakeboarding easily accessible with our deepwater pool, spa tub, cabana, 900 foot private beach, and 130 foot dock on crystal clear Caribbean water. Casa Vista Verde covers 8.5 landscaped acres on Milton Bight, a picturesque bay on Roatan’s north shore, slightly east of the island center. Airport transportation, provisioning before and during your stay, and 6 days per week of housekeeping and day meal preparation are included with your stay. Visit Casa Vista Verde for the best Roatan has to offer! Before buying, I was looking for enough space to insure guest privacy; beach, waterfront, and boating activities worth the travel; construction of the highest quality; residents and government friendly to U.S. investment and tourism; and the chance to incorporate yachting service standards in our offerings. After searching most of the Caribbean and parts of the Pacific looking for the right spot, Roatan fit the bill perfectly! Roughly 900 feet of white sand beach directly on the property, with dock, palapa, and beach cabana for your enjoyment! Enjoy 900 feet of private beachfront, with snorkeling, scuba, jetski, wakeboarding, boating, fishing, kayaks, paddleboarding, and other water activities easily accessible. Two pre-loaded prepay cell phones with US call capability provided. Bed linens, bath towels, and beach towels supplied, with laundry service. Washer and Dryer located in laundry room next to the kitchen. Additional washer and dryer located in garage. Two. Outside clothesline also available. Three car garage houses 80kw diesel genset, snorkeling and fishing equipment, and beach toys, while still providing room for vehicle parking. 54Mbps WiFi available inside and outside the villa and at the beach cabana using seven access points. Wired network outlets in living areas, cabana, and each bedroom. Everyday settings for sixteen. Event dishware and seating for up to thirty guests. 3- main living room (with patio speakers), media room, and cabana. Downstairs Bar/Media Room with poker table/bumper pool table. 15 board games for all ages. Media library system with CDs from more than 1000 artists playable through two surround sound systems, upper and lower patio outdoor speakers, and remote wireless soundsystem. Over 900 DVD-quality movies on media server system accessible via simple remote control. 9 acres of landscaped grounds with pineapple, limes, guavas, mangos, and more growing on the property! Upper patio with 220 degree view of the reef, cafe tables and chairs perfect for morning coffee, and comfortable day bed perfect for an afternoon siesta. Lower patio features two large glass patio tables seating 16, perfect for an evening meal outside in any weather. Both patios feature dimmable lighting and remote speakers. Saltwater pool with infinity edge and bench seating for twelve. Outdoor hot tub seats six comfortably- perfect after a long day in the sun or diving! What a great property and staff! We will be back! I could not give this property a higher recommendation. The staff was great and attentive, the house was large and luxurious and everything was exactly as advertised. We loved the cabana, private beach and boat dock. It was a wonderful way to spend our first week in Roatan. We will definitely be back to stay again! From the moment we were picked up by the house driver at the airport until the handshakes and hugs goodbye, we were treated to smiling expert hospitality. There are many beautiful homes on Roatan; you can see many of them if you take a water tour. What makes this beautiful place special is the staff. The home is clean, bright and spacious; plenty of room for our four couples. The grounds are well tended, and the well-featured cabana (kitchenette, restroom with shower and dining table) is ideally situated above the white coral beach. A short stroll down the beach brings you to the resort next door complete with a restaurant / bar and all manner of activities, from watercraft rentals to horseback riding. We spent many hours in the infinity edge saltwater pool, as well as the spa. Views from the upstairs balcony are stunning: the blues, greens and gentle breakers over the coral reefs of the Bay of Honduras as well as the ever-changing cloudscape are on full 270 degree display. In the evenings we retreated to the basement for a hearty game of bumper pool and big-screen TV. Well off the beaten path, this home is ideally suited for leisure. Although the house was a sanctuary, the staff gladly chauffeured us to some incredible locations: the monkey and sloth rescue, West End and West Bay, Big French Key, an awesome Mangrove forest, multiple snorkel sites, and deepwater fishing. The warmwater snorkeling and healthy reefs are a delight to explore. With both breakfast and late lunches, always with local provisions and flavors expertly prepared provided by the awesome kitchen staff, we rarely needed a dinner out. Our custom experience would NOT have happened without the dedication and response of the expert manager Ana and her team, though. Heartily endorse this experience! Thank you so much for your kind review! We so enjoyed hosting your stay, and look forward to your return with your family! Casa Vista Verde-World Class Villa and Staff. Our stay at Casa Vista Verde on the beautiful island of Roatan was a vacation of a lifetime. The villa itself was amazing. Built on a hill overlooking the second largest reef in the world, the villa provided breath taking views which never got old. The layout of the villa was excellent, five bedrooms, each with a private bath. The patio with an infinity-edge design pool, outdoor spa, super comfy chaises, and tables and chairs was the place to be when we weren’t experiencing the remarkable attractions around the island. If the pool wasn’t enough, the beach was a short walk down the stairs from the villa. The things to do on the island seemed to never end, which is why we are planning our next trip to Roatan. The villa supplied kayaks were great fun, paddling around the cove. We jet skied for an afternoon and took a sunset horseback ride on the beach and through the water to a neighboring island which was beautiful. The snorkeling was perhaps my most vivid memory. The beauty found in the reef, a 10 minute boat ride from the villa was something I have never experienced. We golfed at the world class Black Pearl Golf Course in which each hole offered stunning panoramas of this island paradise. We enjoyed the beach at West Bay and shopping and dining at West End. The food was amazing. The great people at the Casa Vista Verde provided a daily breakfast which rivaled any 4-star restaurant in the states. We dined at restaurants two evenings while the other five nights we had dinner at the villa. We enjoyed dinners prepared by a guest chef, Francisco, who prepared grilled lobsters tails over risotto, filet mignon, grouper, and ribeye steaks. Each meal was served like a work of art. The staff at Casa Vista Verde was incredible. Ana was our cruise director, and her attention to detail was perfection. From coordinating transportation, meals, and provisions for our stay, we knew we were in a well-oiled machine that went on like clockwork. Sayda and Joselyn were working their magic in the kitchen. Hector and Neptali took care of the the grounds and the kayaks and other boats. The villa was always clean and the staff managed to do our laundry each day. This is the first vacation that I went home with a suitcase full of clean clothes! Our week at Casa Vista Verde and the island of Roatan was a trip of a lifetime! Thank you for your kind words! We look forward to seeing you and your wonderful family again! Our family of 10 from ages 6 months -76 years old had the best time ever. The staff was amazing and inviting !! We travel frequently and always choose a different destination. However, We will be back here again soon. Dear Mrs. F, thank you so much for your kind review! It was a true pleasure hosting your family, and we look forward to seeing you again soon! 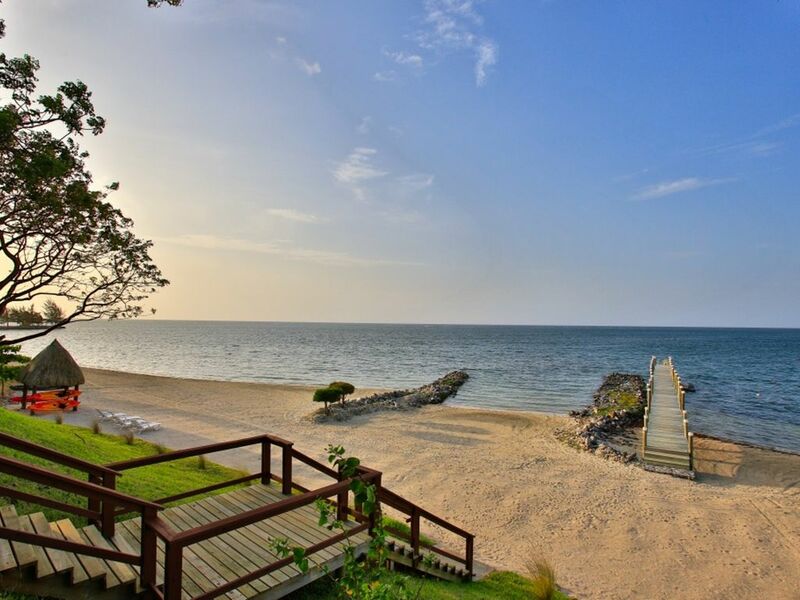 Casa Vista Verde is located on Milton Bight, on Roatan's unspoiled North Shore, slightly east of the island's center. Spectacular panoramic views, uncrowded coves and inlets, and abundant fish, wildlife, and greenery characterize the area. Area attractions also include nearby restaurants and bars, golf, and nature tours. Casa Vista Verde's 900 feet of shoreline make your favorite water activities like diving, fishing, snorkeling, and kayaking convenient and accessible. Golf: The Black Pearl, rated the #1 course in Honduras, just 10 minutes away! Above rates for six guests. $55 per night per additional guest surcharge applies for larger groups. Discounts also available for stays longer than ten days. Electric is billed at cost (typical $100-$250 per week). Rates subject to change until reservation is confirmed.